Elixir Strings with thin Nanoweb coating sound great 3 to 5 times longer than ordinary strings. They have the bright tone and punch of non-coated strings. All this and they still feel like traditional strings! Gauges: .011 - .052w. 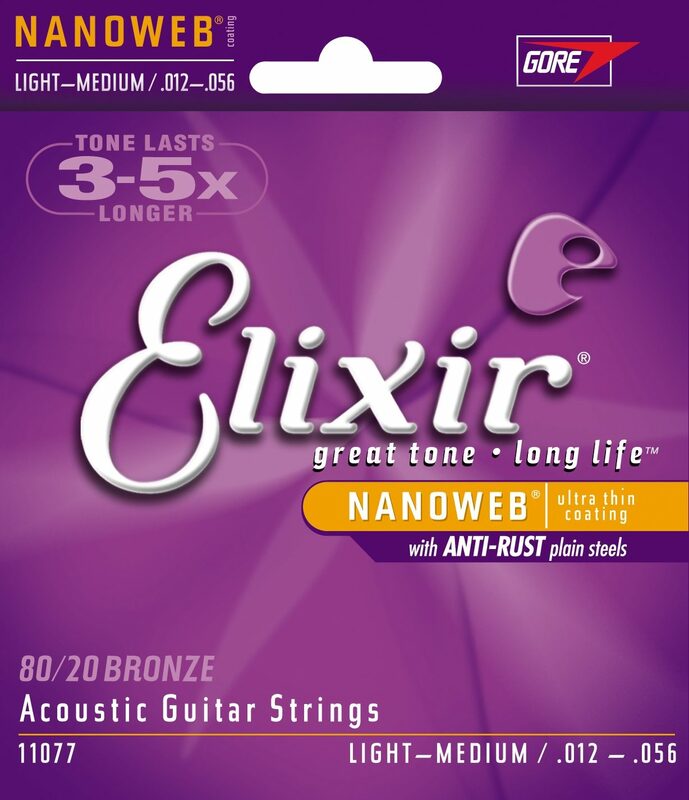 zZounds is an authorized dealer of Elixir products. Sound: I keep set of nanoweb lights on my Martin HD28 and mediums on my Taylor 610CE and been using them for over 5 years. I change strings every four to five weeks. They give me the sound I like. If there was a better product out there I'd be using it. They make my guitars come alive and I've yet to break a string. Feature: I tried the Polywebs they sounded dead when I first put them on. The Nanowebs sound bright,clear and clean. They sound pretty. Ease of Use: You don't get the squeaking. Quality: They intonate perfectly. I'm a fanatic about playing in tune. Value: You want good strings you have to pay for them. Manufacturer Support: Never used it. The Wow Factor: I like the the sound. Overall: I try differant brands from time to time and I haven't found anything I like better. Style of Music: Not hung in a bag. Play lots of styles. "Awesome sound but don't last." Sound: For the style I play (contemporary worship) it is the best sounding string I have played. Feature: The thin coating allows the brightness to come out and also cuts way back on finger noise. Ease of Use: Easy and quick to tune the first time and stay consistent. Quality: I am not a hard player but I had an abnormally high number of strings snap on me during a set. Very frustrating. I checked for burrs on saddle and nut and even used a thinner pick but it kept happening. Value: The sound is well worth the money but the longevity is not. Manufacturer Support: I e-mailed the company three weeks ago and have not yet received a reply of any sort from them. Overall: I kept with them for several months but have switched back to D'addario EXP 80/20 which give a comparable sound and do not break as easily.